IK Skin Perfection SCRUB+ 3-in-1 scrub formula has an intensive cleaning effect and is a peeling, lysing and a scrub in 1 product. After use, you will have a radiant and bright complexion. IK Skin Perfection SCRUB+ 3-in-1 scrub formula has an intensive cleansing effect and is a peeling, lysing and a scrub in 1 product. After use, you will have a radiant and bright complexion. 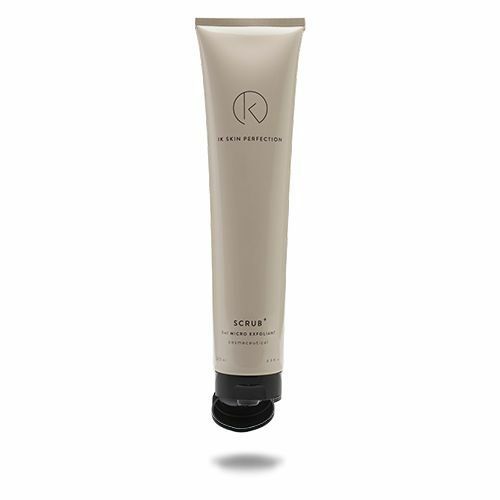 IK Skin Perfection SCRUB+ gently and safely removes dead skin cells. This cream peel is packed with green cosmeceuticals that soften the upper skin layer, effectively removing dead skin cells. In addition to removing dead skin cells, IK SCRUB+ stimulates cell renewal and the production of collagen and elastin, which causes fine lines to fade. IK SCRUB+ also refines the pores. After use of this scrub, the skin looks radiant and even. IK Skin Perfection SCRUB+ contains the Key Actives Bambusa Arundinacea Voice, GENU pHresh and Protease. Bambusa Arundinacea Voice is a natural exfoliant that is extracted from bamboo. Protease stimulates cell renewal and gently exfoliates the skin. IK Skin Perfection SCRUB+ is suitable for combination to oily skin, but also for normal to dry skin. In addition, people with enlarged or clogged pores benefit from this product, as do people with keratosis pilaris and acne on their backs, shoulders and/or cleavage. IK Skin Perfection SCRUB+ suitable for use in phase 2. Apply IK SCRUB+ where necessary and let the product work in for a while. Then massage the product gently with fingers over the face, neck and/or décolleté. Rinse with lukewarm water. For best results, combine IK Skin Perfection SCRUB+ with a 24H cream or serum.